Iran’s Major General Qasem Soleimani, commander of the elite Quds Force, and other Iranian military chiefs are sending stern warnings to Pakistan. This follows the 13 February 2019 attack on their forces by Iranian Baluch militants in the country’s restive Sistan and Baluchestan Province bordering Pakistan. The new tone from Tehran responds to Pakistan’s apparent tilt back towards Saudi Arabia since Pakistani Prime Minister Imran Khan assumed office in August 2018. Tehran is deeply concerned over its vulnerability to the threat posed by a Saudi Arabia and United Arab Emirates (UAE) sponsored proxy war across Iran’s eastern border with Pakistan. Tehran’s messaging intends to deter this development by putting Pakistan on notice that it would pay a severe cost for any complicity in a Saudi–UAE effort against Iran. Five days after the attack was conducted by the separatist jihadi organisation Jaish al-Adl (Army of Justice), who Iran claims is supported by Saudi Arabia, Khan rolled out the red carpet for Saudi Crown Prince Mohammed bin Salman (MBS). The timing of Khan’s five-star treatment of MBS was a telling sign for Iran — it indicated a sharp break from the orientation set by Khan’s predecessor Nawaz Sharif. During his third tenure as Pakistan’s prime minister from 2013 to 2017, Sharif tilted Pakistan’s foreign policy away from Saudi dependence to strike a more balanced position between Riyadh and Tehran. Islamabad was able to sustain this through a massive influx of Chinese investment starting in April 2015. Now totalling over US$60 billion, China’s infrastructure investments aim to establish the China—Pakistan Economic Corridor(CPEC). This extends from the Chinese-administered Gwadar Port on Pakistan’s south-western coast up to Kashgar in China’s Xinjiang region. China agreed to construct most of Pakistan’s portion of the Iran–Pakistan (IP) natural gas pipeline. A boon for energy-starved Pakistan, the IP pipeline would deliver enough gas from Iran’s massive South Pars field to generate 4500MW of electricity. Flushed with Chinese investment and expecting to receive desperately-needed natural gas from Iran, Sharif repeatedly rejected Riyadh’s requests to send Pakistani troops to Yemen. This also came on the heels of greater counter-terrorism cooperation between Sharif and Tehran. In June 2014 Pakistan’s military launched the massive Operation Zarb-e Azb against the Taliban and other associated nexuses of anti-Shia organisations. Many had longstanding links to Jaish al-Adl or its predecessor Jundallah (Army of God). In the same period as Operation Zarb-e Azb, Islamabad reportedly permitted Iran to conduct raids on Pakistani soil in pursuit of Jaish al-Adl militants. This three-year operation likewise represented a remarkable reversal, as Sharif previously recognised the Taliban as the legitimate Afghan government in 1997 during his second tenure as prime minister. The only other country that had recognised the Taliban was Saudi Arabia. Pakistan’s recalibration towards Iran was short lived. In July 2017 Sharif was removed due to allegations based on the 2016 Panama Papers. 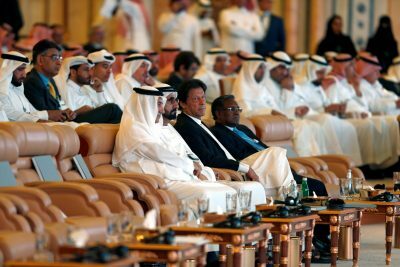 Under Khan’s premiership, Pakistan is returning to the Saudi fold. On 23 October 2018 Saudi Arabia formally gave Pakistan a US$6 billion bailout package — US$3 billion to the State Bank of Pakistan to support its balance of payments and another US$3 billion in deferred payments on oil imports. Two months later the UAE followed suit and announced that it would also transfer US$3 billion to the State Bank of Pakistan. The desperately-needed financial infusions from Riyadh and Abu Dhabi were to prevent currency freefall as Islamabad engaged in bailout talks with the International Monetary Fund. Then on 12 January 2019 Saudi Arabia announced it would join CPEC by constructing a US$10 billion oil refinery at Gwadar Port. Being the first third-party country to join CPEC, Saudi Arabia deftly nullified any benefit Iran’s relations with Pakistan derived from CPEC, leaving the future of the IP pipeline in limbo. Riyadh’s current package for Pakistan now totals US$20 billion, making them and the UAE indispensable to Pakistan’s economic survival. In Sistan and Baluchestan Province the re-alignment already seems to be manifesting. The 13 February 2019 terrorist attack caused 40 Iranian Revolutionary Guard casualties. It is claimed by Iran as evidence of a Pakistan–Saudi Arabia nexus, with Tehran worried Pakistan may potentially accede to the use of its territory by Saudi Arabia and the UAE to support the militants. Soleimani was scathing in remarks towards Pakistan a week after the attack, concluding that a nuclear-armed state like Pakistan should be capable of eliminating a few hundred border bandits. And his superior, Revolutionary Guard Chief Commander Ali Jafari, also threatened Saudi Arabia, the UAE and Pakistan after the attack, denouncing their alleged secret support for the militants. With Pakistan seemingly more firmly tethered to Riyadh and Abu Dhabi, Jaish al-Adl‘s attack sounded alarm bells in Tehran. While Saudi Arabia and the UAE insist on greater Pakistani cooperation to defeat Houthi forces in Yemen, it is also likely that they will push Islamabad to cease counter-terrorism cooperation with Tehran. Pakistan could also be called upon to take a role in coordinating support for Jaish al-Adl operations, if the allegations are true. Whether Pakistan becomes actively involved or merely accedes the use of its territory, Pakistan–Iran relations are changing. Dr Micha’el Tanchum is a Fellow at the Truman Research Institute for the Advancement of Peace, Hebrew University and an affiliated scholar with the Centre for Strategic Studies at Başkent University in Ankara, Turkey (Başkent-SAM). Follow him on Twitter at @michaeltanchum. This article was first published by the East Asia Forum on the 4th of April 2019. This article was republished with permission.